Hot on the heels of our post on Apple iTunes Movie Trailers claim 480p is “HD”, we’ve found another infractor in the collection of companies who aren’t labeling resolutions properly. This time, the company-that-should-know-better is Microsoft. 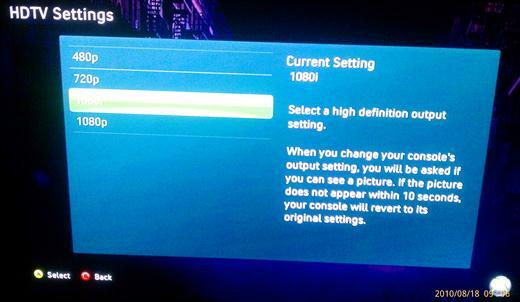 A friend of ours sent in some photos from the Xbox 360 game console, where 480p resolution is labeled as “HD”. Screenshots below. In the photo above, notice that 480p is in the list on the left and on the right it says “select a high definition output”. Again, we’ll point out that 480p resolution does not qualify as high definition. 480p is the resolution utilized by DVD’s and is classified as “enhanced definition”, while anything 720p and up can be labeled as HD. To give Microsoft the benefit of the doubt in the second photo, perhaps they are only referring to the component cables as an HD capable transport method, but either way, their resolution selection screens could definitely be labeled a bit better, as they’ve caused some users to question whether 480p is indeed high definition, or not. Have you seen 480p incorrectly labeled as HD or high definition? If so, we’d love to hear about it, so please let us know. Thanks to Oliver for sending this in.